RUGBY UNION: Halfback Will Genia revealed he was the player behind the blistering halftime spray that fired up the Wallabies against Argentina a fortnight ago. The Wallabies trailed 13-10 against the Pumas in Canberra after being bullied at the breakdown, but prevailed 45-20 after Genia's stinging verbal blast. Coach Michael Cheika said after that match in Canberra he had not needed to give his own halftime rev-up because the leadership group had done that, though no player was publicly singled out. However, after arriving in Buenos Aires from South Africa - where Australia drew 27-all with the hosts - vice-captain Genia conceded he was behind the stern talk in Canberra about the breakdown. "I was the one doing the spraying. I was having a red-hot crack," Genia said. what I expect from them. "That's what I want, that's what, as a team, we need and putting that responsibility on the forwards to make sure they deliver that. "With the way that we play the game if they can deliver that for us and give us that platform, more often than not we are going to win games because of them, not because of individual brilliance in the backs. "If you look at the times we have played well it's about them carrying well up the middle and giving us good, clean, quick ball and the backs taking advantage of whatever space that creates." 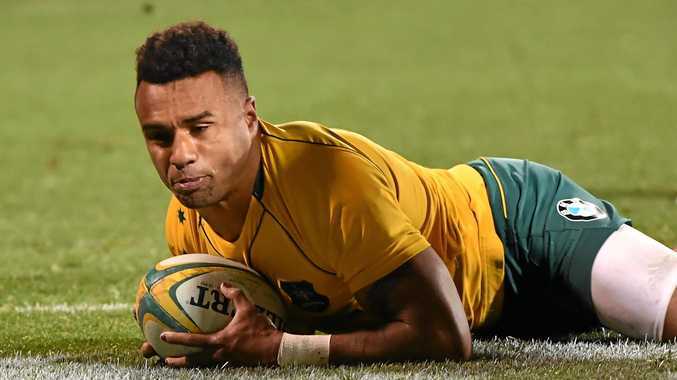 Genia said it was one of the most savage sprays he'd given a team in his career. "It'd be up there, because I remember when I was coming in I was just filthy because as a halfback you don't like having to dig for the ball or getting bumped off the ball," Genia said. "But it wasn't about me, it was more the fact that I knew if we could get that right as a team, we could function, we could get a result, we could start playing some good rugby and get some enjoyment out of it. "That was more the motivation for the spray more than anything else. "I spoke to Cheik about it as well, being specific in your messaging, not just waiting for things to happen but being proactive about it. "It's something I learned from that experience and it's definitely helped me grow as a player." The Wallabies' win over Argentina remains their only victory in the 2017 Rugby Championship, but heading into this weekend's match in Mendoza they still have a chance of finishing second if they win again and the All Blacks defeat the Springboks in Cape Town.